AGENCY: Office of Federal Acknowledgment, Interior. Federal Acknowledgment, (202) 513-7650 . Secretary–Indian Affairs by 209 DM 8.
acknowledgment as an Indian tribe in 25 CFR 83.7.
was published in the Federal Register December 11, 2002 (67 FR 76184). evidence to demonstrate that community existed between 1940 and 1967. 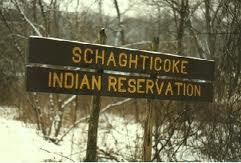 Schaghticoke social and political community between 1967 and 1996.
continuous state recognition with a reservation. third parties addressed criterion 83.7(a) in the comments on the PF. that criterion 83.7(b) is met from 1900 to 1920.
supervision of the Schaghticoke from one state agency to another. criterion 83.7(b) is met from 1967 to 1996.
the community, meets the requirements of 83.7(b). substantial questioning throughout this time period. group, 1820 to 1840 and 1892 to 1936.
direct evidence of political processes. the specific nature of their continuous relationship with the State. ceased to exist as a political entity during these periods. decade 1821-1830, there was an overall endogamy rate of 40 percent. 83.7(c)(3) for the two decades 1821-1840.
we Dwell about Seventy Souls of us” and requested missionaries. authority or influence among the Schaghticoke for this time period. from 1801-1820 and 1841-1870 under 83.7(c)(3). criterion 83.7(c) from 1870 through 1892.
collected substantially later identify several individuals as leaders. in time when there is specific evidence of Schaghticoke leaders. of 83.7(c) between 1892 and 1936.
community had been demonstrated for the time period from 1940 to 1967.
evidence that criterion 83.7(c) is met from 1936 to 1967.
criterion 83.7(c) for this time period. present. This FD acknowledges the entirety of this political body. included a description of its membership criteria. the STN meets criterion 83.7(e) is confirmed. a government-to-government relationship with the United States. continue until no later than 30 days after publication of this Notice. parties to the litigation or not, to seek reconsideration before IBIA. Principal Deputy Assistant Secretary–Indian Affairs.